Government of Pakistan, Cabinet Secretariat, Establishment Division has issued Notification No. 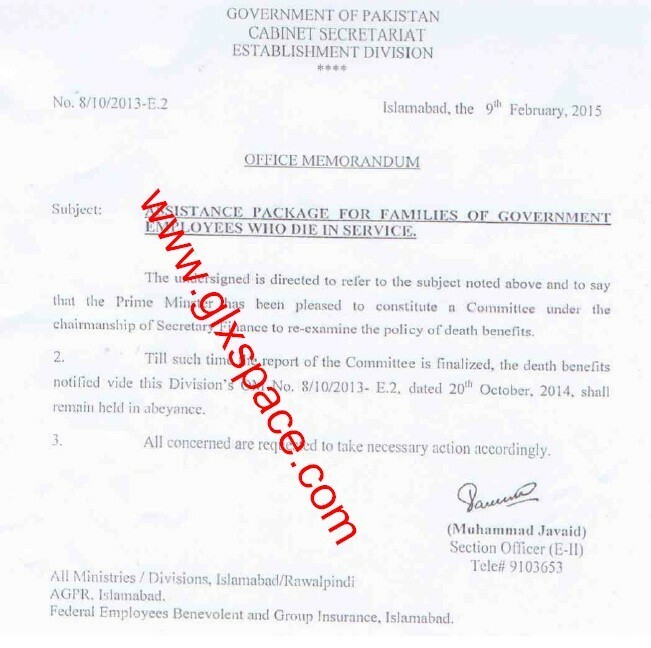 8/10/2013-E-2 dated 09-02-2015 in connection with Assistant Package Notification for FG Employees held in abeyance. 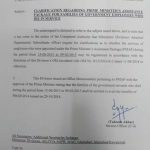 The undersigned is directed to refer to the subject noted above and to say that the Prime Minister has been pleased to constitute a Committee under the chairmanship of Secretary Finance to re-examine the policy of death cases. Till such time the report of the committee is finalized, the death benefits notified vide this Division’s O.M No. 8/10/2013- E-2 dated 20-10-2014, shall remain held in abeyance. 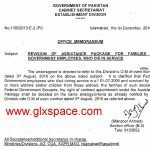 You can read the above mentioned Notification of Assistance Package for the Families of the Federal Govt Employees who died while in service. 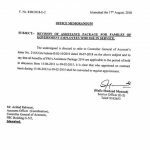 Special Thanks to Mr. Almas Malik for sending the information regarding Assistant Package Notification for FG Employees held in abeyance. A.o.a sir mery father nadra k employee thay medically unfit retired hue 2006 mai. Kya kisi k pas koi rule ki copy hay. 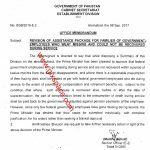 All effective legal heirs of assistance package are requested to write application to Prime Minister to reconsider the effective date of notification, and approach media to help. wafaqi mutasib me case kren 2014 wale sub for thier rights. Tell me tha also.. if any other package for on duite death.. my father was a govmny employee in wapda... our family is in vry heard dicess..plzz tell me soon..
Plzz tel me tha any new update for this assistant package.. plz tell me as soon as.. I am very disappointed with PML-N Govt. Policy regarding govt employees, My father served this country with his hardwork and loyalty till his death, but in return our govt can't give us enough money to build our own house. Any update of assistance package? Dear Bilal there are chances that the revised package will soon be announced. Untill that is issued you can try onthe basis of previous notification of 2006. AOA, mery shohar ko fot hoy aik sal ho gia hy magar mujhy ab tak aik paisa ka benefit ni dia ja raha. 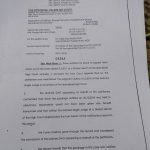 Office reply tak ni dita udhar mery susral walon ny property distribution ka case kia hua hy jis ki waja sy Succession Certificate be late ho raha hay. Mujhy kia krna chahay. Dear Eram you should visit the concerned office for the latest updates of the case. Dear Asim still no updates about the same package. Dear Syed Mirwais this packages is not implemented for provincial/local Governments. I think the new package is cancelled. at least being a human the Government should send the notification to adopt the previous notification because the the affected peoples are real in trouble and they avail the nothing. I request to all the affected peoples , Please raise your voice at every forum on social media or every place you get. Dear khurshid nasir still no updates. As soon as i get the updates I ll share. have you know any affected people who belongs to CDA???? Dear Dilshad I have not the info about the same. The assistance package which was announced in October 2014 which has been suspended in feb. I have read all the deatils of both memorandum i just wanted to confirm that, will be PIA employees accommodated with this assistance package which was announced in October. Dear majid jadoon mujhay is ka confirm nahin hay. Is there any way possible to confrm it. I spoke to 1 of my friend studying LLM in cooperate law. He was not even sure that PIA will be under this or not.......! Kab tak notification jari karengay is k ?? Kuch malomat hai apko ?? Dear khurshid nasir still no updates of the same Notification. Case job k packge ko effect kr skti hai ??? Dear khurshid nasir I think it will not affect much. I hope that the revised Notification will also include regular job. If the revised Notification is delay u can still get the job on the previous notification on the contract basis for two years. Phir job k process ko department ne q roka hai ?? Just ... shumaila kamal am i right ?? Dear Khurshid I think they will lessen the amount. Dear Shumaila.....held in abeyance affect the job also.....cda stuck everything due to that held in abeyance notification.not hired on contract basis. Madam kia ap bta skti han ha revise notification kb tk ho jai ga. oar abhe kia status ha file ka. Dear Imran is ki koi exact date nahin hay. thanx age koi update hoi to share with us. Dear Umar Allah per bharosa karo aour apni qualification kay mutabiq kisi bhi job kay liay apply ker do. Dear Umar yes you will get the benefit. Dear Umar, you should email me all details. sir, 5 monts ho gay my fother had died na pession laag rhey no salary. Dear MUHAMMAD ASIM u have to contact ur Accounts/Pension Office. Dear Adeel You come under this Notification but hope for the best about the new Notification. It is nothing but hypocrisy of Noon league. 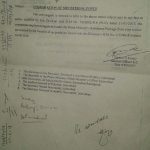 Dear Umair according to the new Notification all the assistance package cases have been suspended till further orders. I think this notification was issued due dharma pressure.